Mahatma Gandhi is considered by many the father of the Indian independence movement. He worked diligently using his concept of Satyagraha to end the British rule in India as well as to improve the lives of India’s poor people. Mohandas Karamchand Gandhi or Mahatma Gandhi was a renowned freedom activist and an authoritative or powerful political leader who had played an important role in the India's struggle for Independence against the British rule of India. He was also considered as the father of the country. No doubt he had also improved the lives of India's poor people. His birthday is celebrated every year as Gandhi Jayanti, a national Holiday in India. His ideology of truth and non-violence influenced many and was adopted by Martin Luther King and Nelson Mandela for their own struggles. In South Africa for about 20 years, Mahatma Gandhi also protested against injustices and racial discrimination using non-violent method of protests. His simplistic lifestyle won him admirers both in India and outside world. He was popularly known as Bapu (Father). He was born on 2 October, 1869 in Porbandar, Gujarat. His father’s name was Karamchand Gandhi and mother’s name was Putlibai. At the age of 13 years, Mahatma Gandhi was married to Kasturba which is an arranged marriage. They had four sons namely Harilal, Manilal, Ramdas and Devdas. She supported all the endeavors of her husband till her death in 1944. His father was Dewan or Chief Minister of Porbandar, the capital of a small principality in Western British India (Now Gujarat State). Mahatma Gandhi was the son of his father's fourth wife Putlibai, who belonged to an affluent Vaishnava family. Let us tell you that in his earlier days, he was deeply influenced by the stories of Shravana and Harishchandra as they reflected the importance of truth. When Gandhi was 9 years old he went to a local school at Rajkot and studied the basics of arithmetic, history, geography and languages. At the age of 11, he went to a high school in Rajkot. Because of his wedding, atleast about one year his studies was disturbed and later he joined and completed his schooling. He joined Samaldas college in Bhavnagar in 1888 at Gujarat. Later, one of his family friend Mavji Dave Joshi to pursue further studies that is law in London. Gandhi ji was not satisfied with the studies at Samaldas College and so he became excited by the London proposaland managed to convince his mother and wife that he will not touch non-veg, wine or women. In the year 1888, Mahatma Gandhi left for London to study law. There, after 10 days of arrival, he joined the Inner Temple, one of the four London Law colleges and studied and practiced law. In London, he also joined a Vegetarian Society and introduced to Bhagavad Gita by some of his vegetarian friends. Later, Bhagavad Gita set an impressions and influence his life. In May, 1893 he went to South Africa to work as a lawyer. There he had first-hand experience of racial discrimination when he was thrown out of the first class apartment of the train despite holding the first class ticket because it was reserved for white people only and no Indian or black was allowed to travel in the first class. This incident had serious effect on him and he decided to protest against racial discrimination. He further observed that this type of incidents is quite common against his fellow Indians who were derogatorily referred as coolies. On 22 May, 1894 Gandhi established the Natal Indian Congress (NIC) and worked hard to improve rights of Indians in South Africa. 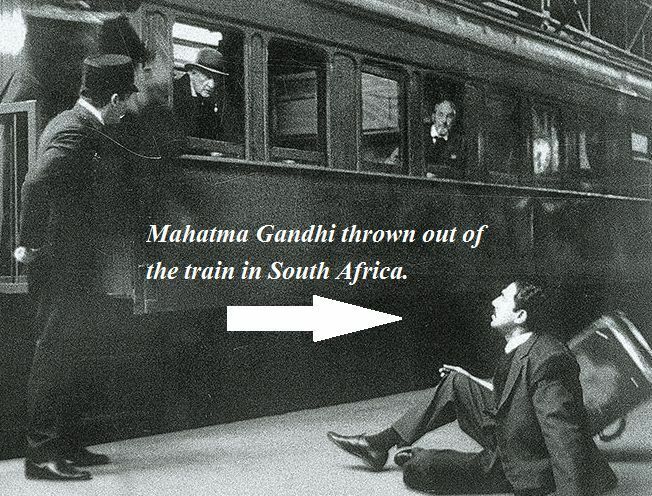 In a short period of time, Gandhi became a leader of the Indian community in South Africa. Tirukkural an ancient Indian literature, originally written in Tamil and later translated into various languages. Gandhi ji was also influenced by this ancient book. Actually, he was influenced by the idea of Satyagraha that is devotion of truth and in 1906 implemented non-voilent protests. He returned to India in 1915, after spending 21 years of his life in South Africa and no doubt, there he fought for the civil rights and at this time he was transformed into a new person. In the year 1915, when Gandhi ji returned to India permanently and joined the Indian National Congress with Gopal Krishna Gokhale as his mentor. Gandhi's first major achievements were in 1918 when he led the Champaran and Kheda agitations of Bihar and Gujarat. He also led Non-Cooperation Movement, Civil Disobedience Movement, Swaraj and Quit-India movement against the British government. Gandhi identified his overall method of non-violent action as Satyagraha. Gandhi's Satyagraha has influenced eminent personalities such as Nelson Mandela and Martin Luther King in their struggle for freedom, equality and social justice. Satyagraha is based on the truth principles and following non-violence at the same time. Mohandas Karamchand Gandhi was assassinated on 30 January 1948 by Nathuram Godse. Godse was a Hindu nationalist and a member of the Hindu Mahasabha. He accused Gandhi of favouring Pakistan and was opposed to the doctrine of non-violence. • Hind Swaraj, published in Gujarati in 1909. • He edited several newspapers which included Harijan in Gujarati, in Hindi and in the English language; Indian Opinion, Young India, in English, and Navajivan, a Gujarati monthly. • Gandhi also wrote his autobiography, The Story of My Experiments with Truth. • His other autobiographies included: Satyagraha in South Africa, Hind Swaraj or Indian Home Rule. • In 1930, Gandhi was named the Man of the Year by the Time Magazine. • In 2011, Time magazine named Gandhi as one of the top 25 political icons of all time. • He did not receive the Nobel Peace Prize despite being nominated five times between 1937 and 1948. • The Government of India institutionalized the annual Gandhi Peace Prize to distinguished social workers, world leaders and citizens. Nelson Mandela, the leader of South Africa's struggle against apartheid was a recipient of the award. Ben Kingsley portrayed Mahatma Gandhi in the 1982 film Gandhi, which won the Academy Award for Best Picture. Therefore, Mahatma Gandhi would be remebered forever as he spread the message of non-voilence, truth, faith in God and also he fought for the India's Independence. His methods inspired various leaders, youth not only in India but also out of India. In Indian history, he is considered as a most prominent personality and as a simplest person who wear dhoti. He spread the message of swaraj and taught Indian how to become an independent.